It was time to cut my hair and send it off to Locks of Love. A week later, when I friend came up to help us pack at my parents house, I asked her if she would do the honors…. and off we went outside to get it done. All that was left was a little trimming to even it up and we were back inside packing boxes again. Each of the five times (this might have been the 6th time, I have lost count) that I have cut my hair for Locks of Love I go through a thought process of “should I cut it now, or wait” then a day later I am tired of brushing through the length of the hair and also tired of finding long hair on everything that I know it is time. I used to cut it every 18 months, but I cut it in the beginning of summer and will be much cooler for me. 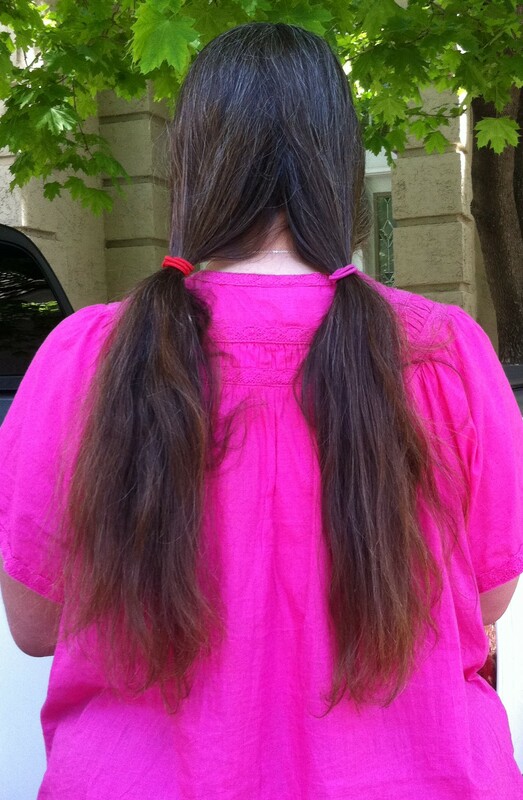 My hair tends to grow fast and I wish I would have started cutting in many years ago for Locks of Love. I can’t turn back the clock on the cutting part, or even the gray in my hair, but I know as long as my hair keeps growing, I will cut it and send it off. Even though my hair has gray in it, they will still take it. They will sell it and use the money to help keep their organization going. 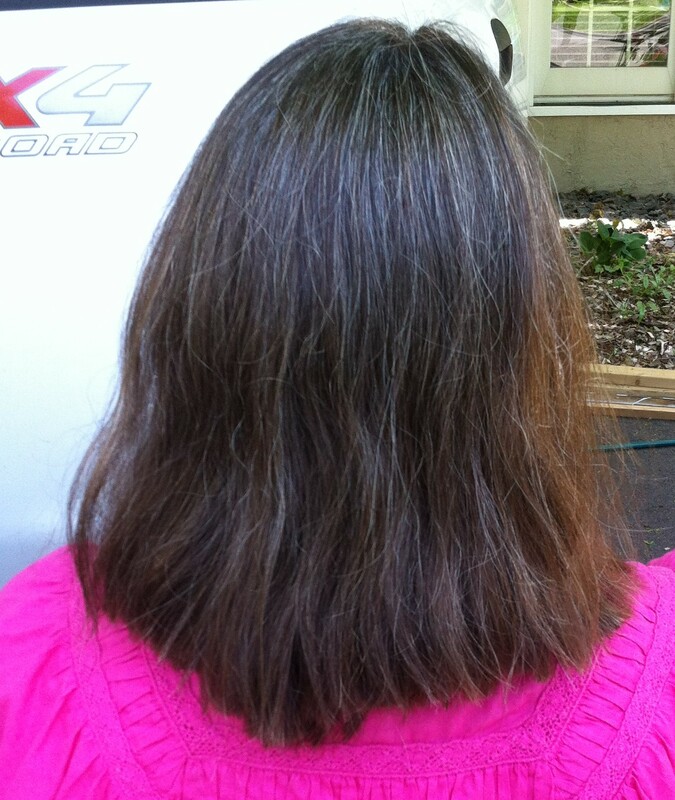 Have you cut and donated your hair in the past? Are you inspired to do it now? 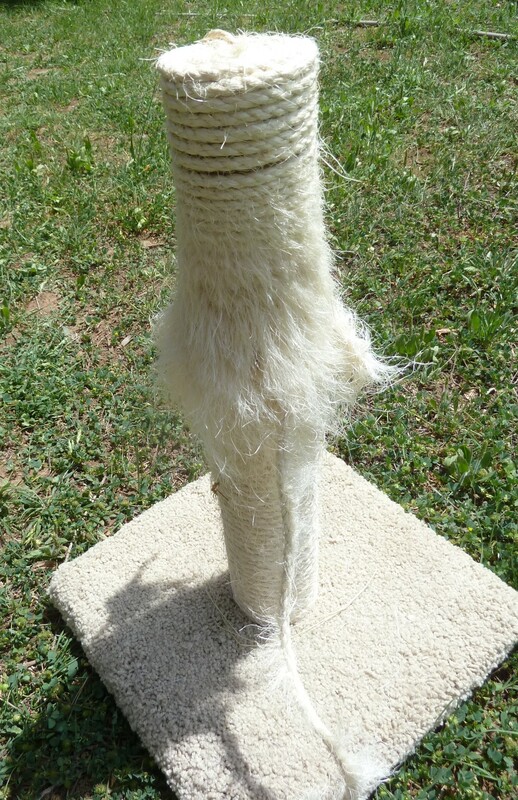 I am really tired of throwing away good money on cat scratching posts that don’t hold up very long. 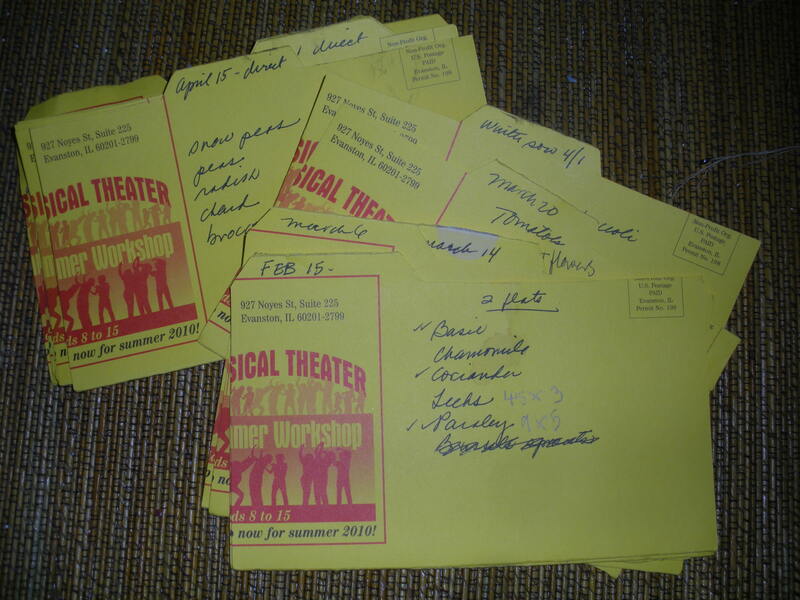 I have thought about re-covering the old, tattered, worn out ones for way too long…. I finally decided to do something about it. The two girls have been really good about using the cat scratching posts over the course of their 13 years, until recently. One of them has decided to use the corner of a chair, so I have four cat scratching posts in that area AND SHE STILL GOES TO THE CHAIR! There is another scratching post in our bedroom that she uses A LOT and that is the one you see in the photo. It is long overdue for a makeover! 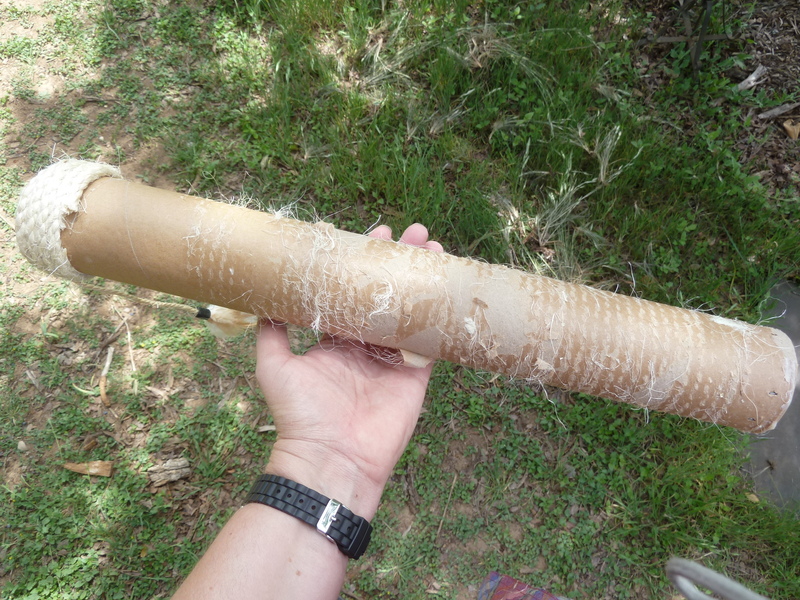 Why would I want to take the time to re-cover these scratching posts? I started by removing most of the older rope. I unwound the new sisal rope before I started so I wouldn’t be fighting with it as I needed it. Right away I could tell this was going to be a job that would go faster with three hand…. but I only have two. 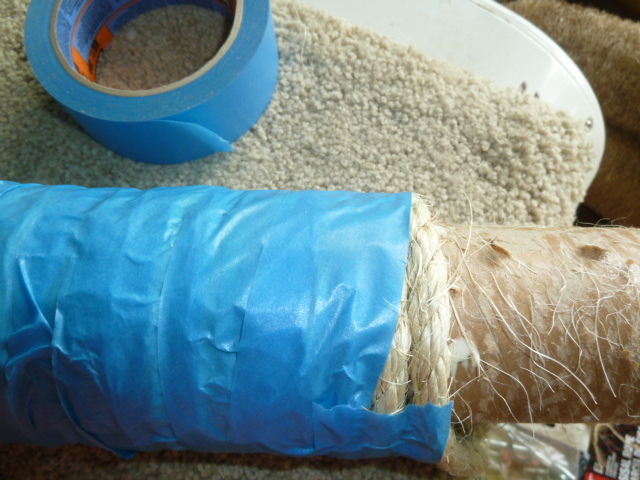 I applied glue to the round tube a little at a time. If I tried to glue a section, I just managed to get glue on my fingers and dripping off the tube, so i just glued enough to wrap the rope around once, hold it in place with my hand, then glue another ring. I feel pretty good about how this project turned out. 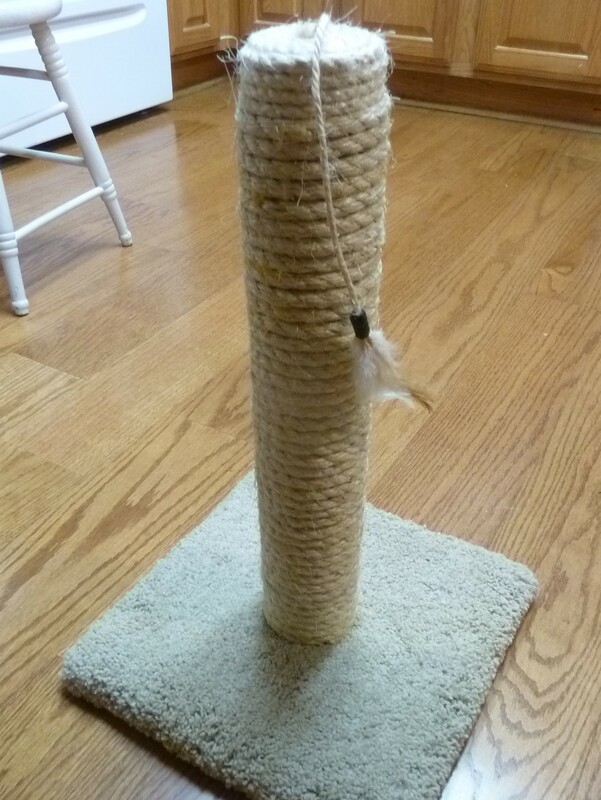 I fell better about being able to re-use most of the original scratching post and keep it out of the landfill. I also feel good about most of the supplies I used. I will take a bit more time to see if I can source some sisal rope made in the USA. Have you taken on a project lately that has saved you money? The three water gardens we put in a few years ago are doing really well. In the one that is lower to the ground, we have frogs and toads using it and singing happily on various nights. The little minnow-type fish all also happy and multiplying in all three water gardens, keeping them clear of nasty mosquito larva. I also have one open 55-gallon drum that catches water from a leaky rain gutter that I have also put those little fish in and they are working hard in there too. Last spring when 2 mama deer decided our fenced in backyard was a perfect spot to have their babies. They thought it was great. I thought something completely different. since then there are a few deer that frequent the back yard every day…. munching their way through this and that (including all the native and “deer resistant” plants I have back there. I know there is never a guarantee to the “deer resistant” things, what makes me so mad is that things were going along great until these two mama deer had their brilliant idea. While these deer make their daily and nightly visits one of them favorite treats seems to be the lily pads and water lilies! Well, I fixed that. I put a piece of hardware cloth over each water garden. HA! 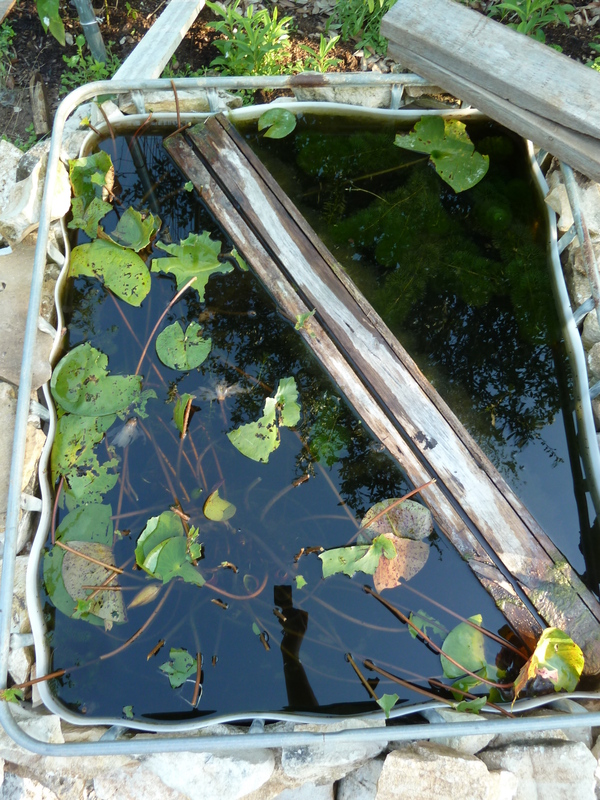 it isn’t the prettiest things, but the lily pads and water lilies are able to grow and do their thing. This was a great quick fix. 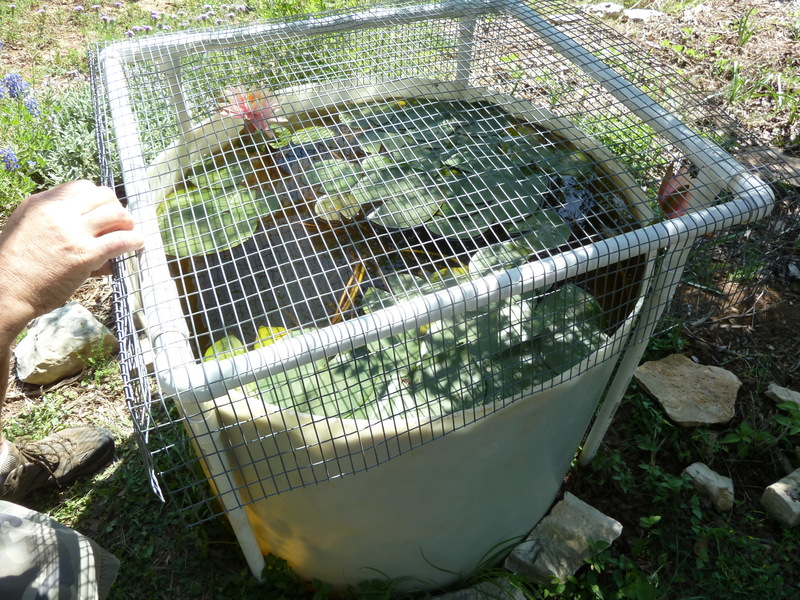 One of the water gardens has a metal cage around it and the hardware cloth is raised up above the water lever about 7″ giving the water lilies room to pop up out of the water and flower. The hardware cloth on the other water garden sits right on the top and the water lilies try to come up and bloom, but are scrunched and squished. So my husband built a quick little frame that would raise the hardware cloth up a bit so there is enough room for the water lilies to bloom. What is great about this little renovation is that everything we already had everything that we needed sitting around waiting for just such a project! We didn’t have to buy a thing – that is always a great thing. My husband built a PVC frame that would raise the hardware cloth up higher and then he bent it down on two of the sides and trimmed excess off one end and added it to the front. That enclosed three sides so the deer couldn’t nose their way in between the top of the frame and the water garden to get at those scrumptious lily pads! 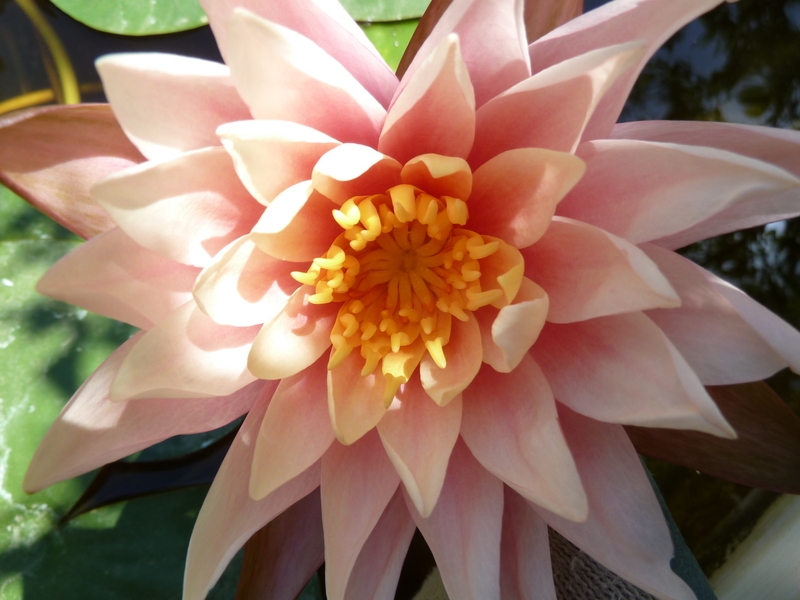 So far, so good, The water lilies are able to pop up and bloom with all the room they need and we get to enjoy them. One very small REAL Renovation success for us! Do you have to protect something in your yard from deer or dogs? What is your solution? 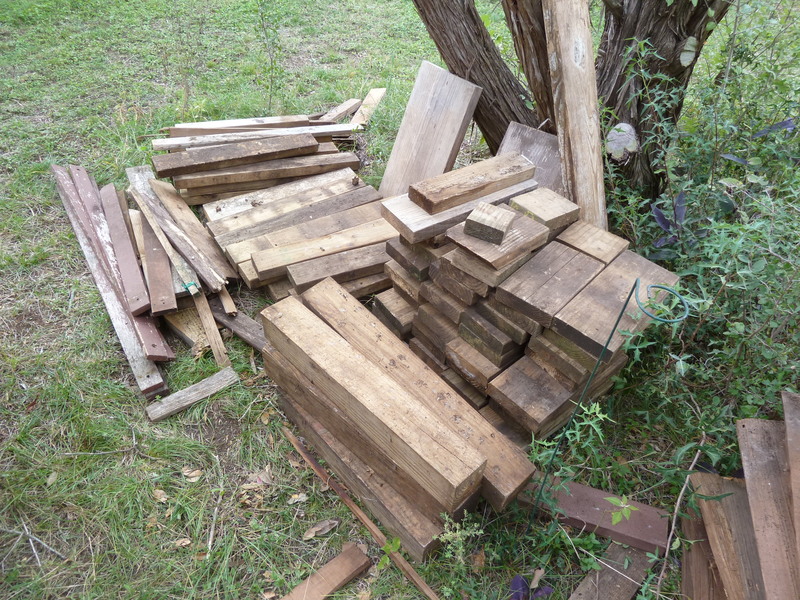 Yesterday I posted about some free wood scraps (cut offs) that I got from a neighbor. 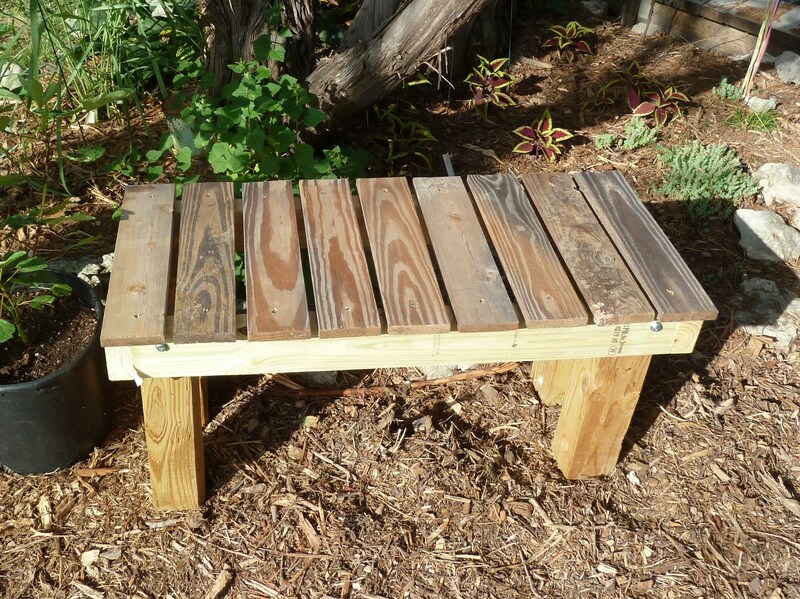 Today I wanted to show you the benches that I made using similar scraps of wood. I originally saw this bench design at my next door neighbors. He is the woodworker that I have posted about before (over at Sincerely, Emily) who makes wooden toys and the bus. He is very handy, and builds a lot of other things that they need or want around the house/property like a tall, large tripod to hang large wind chimes in or trellis for any vines. He also built a pergola off their screen porch and aviaries for their doves and another one for a parrot. Small scale or large scale, he has his hands in it and he has always had a pile of scrap wood to use along the way. 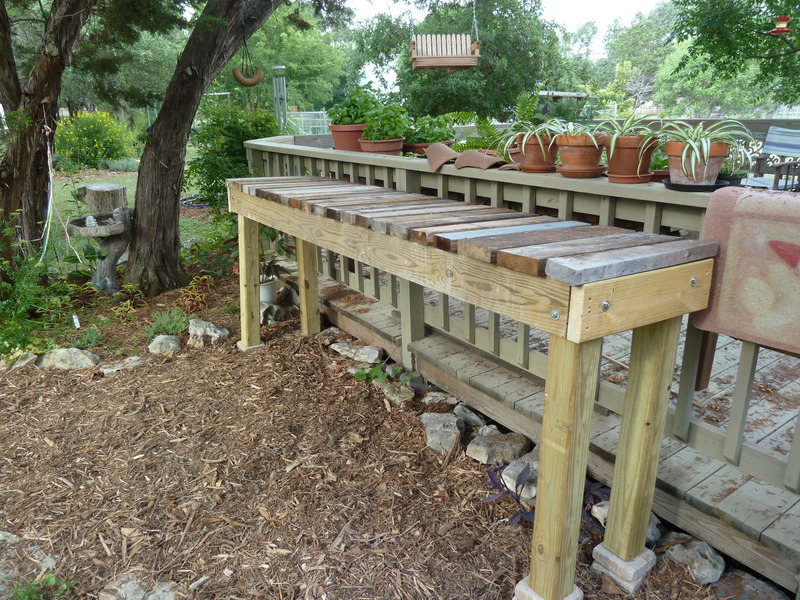 What is so great about these benches is that you can make them any height and any length. You just build them to fit the space you need to fill or the area you want to use them. Not only can you make them to fit your space, but the scarp wood you use for the horizontal pieces on top can be mixed and matched. They can be 2×2’s, 2×4’s, 2×6’s, etc. I am definitely not picky and do not need them all to be the same. I love using the 4×4’s for the legs. They make the bench very sturdy and will take the weight of a lot of plants or a person if you are making it to sit on. 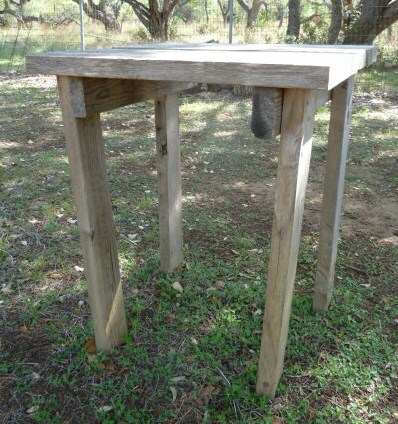 The smaller tables my step-dad made for the laundry basket near the clothesline and the compost tumbler where made using 2x’6’s for the legs. Those tables do not need to support a lot of weight, so it was good to use the lumber scraps we had and save the 4×4’s for the plant benches. I put a piece of concrete under each leg (look at first photo) to keep it off the ground and away from moisture so the leg won’t start to rot. Our ground has not been moist or wet very often over the past few years here in South Texas, but if I can help the legs of my benches last just s little longer, I will. I have talked about how strange things get me excited, like free horse manure and free mulch. Well, you can add scarp wood (or cut offs) to that list. What kind of neat free stuff have you picked up along the way? Last fall when my niece was visiting us, we spent some time making cards (and doing many other things too.) At the end of our visit there was a lot of paper scraps and supplies spread all over my work table upstairs. My niece picked up a few smaller pieces of paper and asked about making some little cards with the left over scraps. What a great idea! The tiny Valentine cards I sent to my two nieces were born from that idea. Using up the left over scraps. I never throw my scraps away. 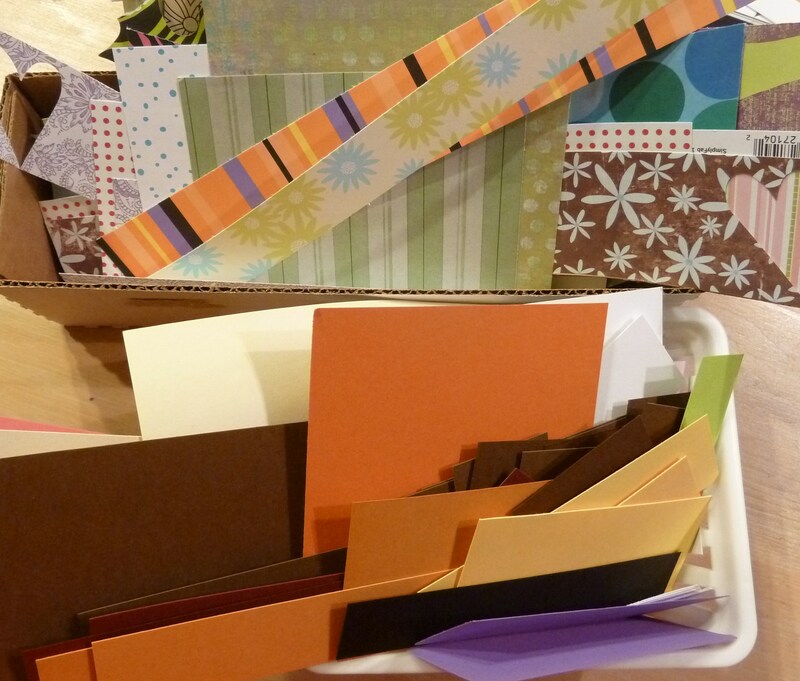 They tend to come in handy at some point in my card making, and here I was digging through the plain paper scraps and designer paper scraps to make tiny cards. Now they have come in handy again. 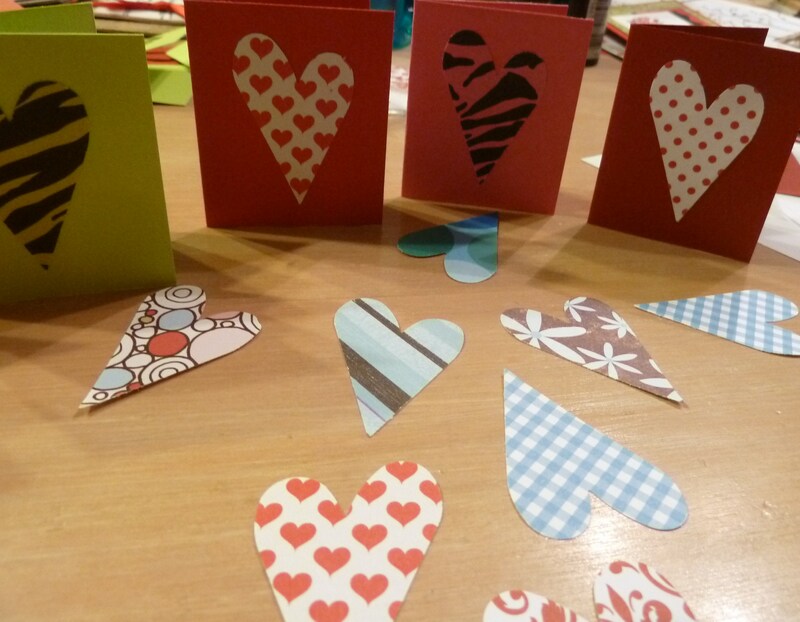 For these tiny cards I used a heart-shaped punch and simply punches out the heart shape from the designer paper. I chose papers I thought each niece would like and tailored it to them with the colors. They can use these cards anytime of year to write a little note to a friend and it will be something special. YOu can even punch a hole and add a ribbon to turn it into a gift tag. The next time I do this I will cut the cards to size and punch out the design and also add a stamped element and let them each assemble their own like I did for my niece in this post. Whether you use scraps of designer paper, old maps, scraps of fabric or even cards that you have received in the mail, this is one way to create another neat little card. A perfect way to reuse and recycle. I know I will be making more of these and including them in different gifts that I send to them. 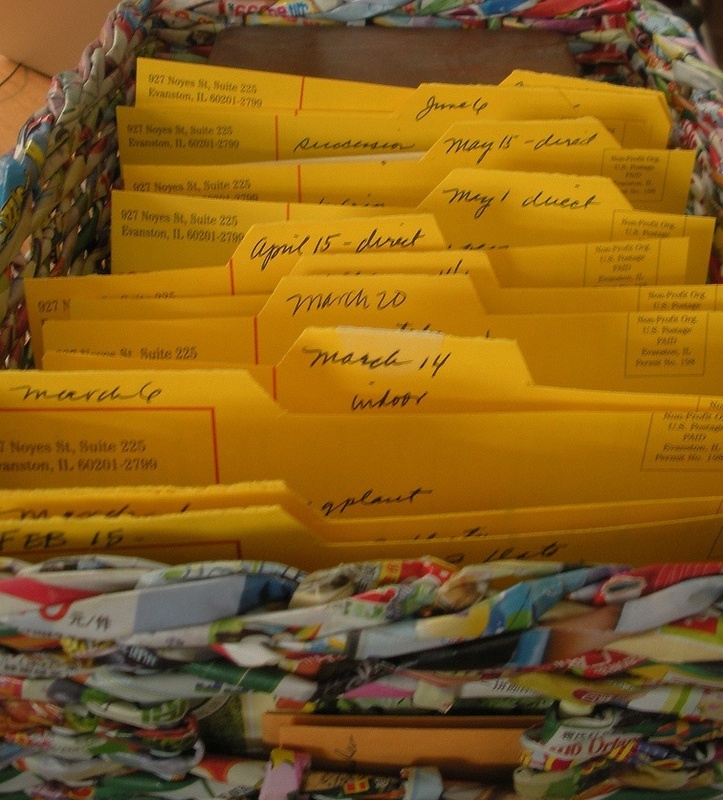 Do you save scraps of paper or fabric with the hopes to use it later? Do you ever get around to using it? I really enjoy giving handmade gifts (like the fabric napkins that I posted about last December.) Those gifts are usually made by me. One of my nieces has a birthday at the end of November. In fact it was just a few days ago so I had to wait until it was passed before I posted about her gift this year. Since she was very very young I have always made her pillowcases. A pillow case for each season plus summer, winter, fall, spring themed ones as well. I can still look into my magic ball and see more pillowcases in her future, but wanted to come up with something different for this birthday. As I was snooping around a thrift store a few weeks ago, I saw a small jewelry box. It was pretty plain (sorry, I completely forgot the “before” photo) but it had potential. I knew I could give it a facelift, but it also appealed the the frugal and thrifty side of me as well. 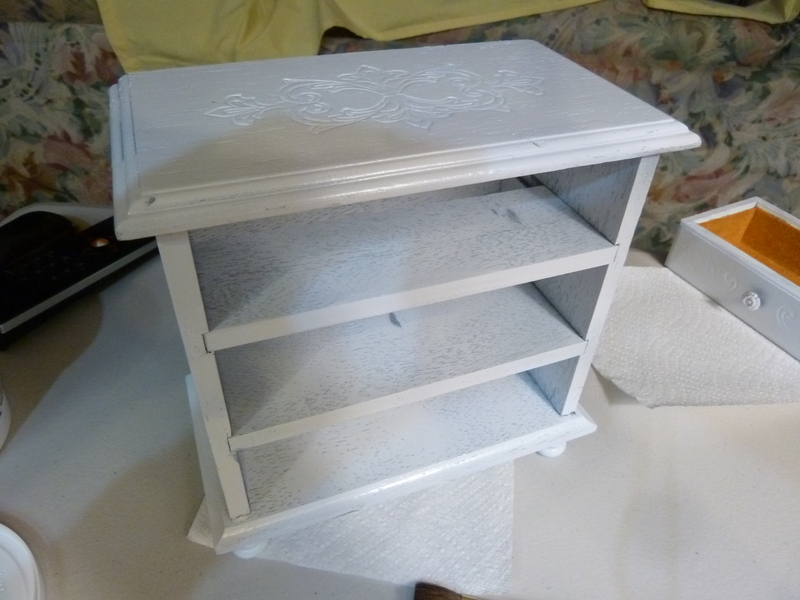 My original plan was to paint the entire jewelry box white and then “white-wash” it with a metallic silver to give it some pizazz and sparkle. I started with the white. I found a can of white spray paint in our garage and decided to use it to make quick work of covering the whole box. 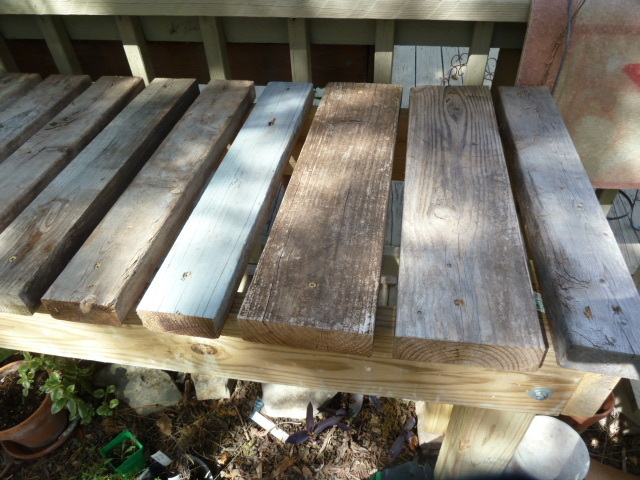 It needed two coats and even then the spray paint wasn’t covering the wood very well. I decided to get out my acrylic paints and go for better coverage with those. That worked a lot better, but the spray paint left a glossy finish and the acrylic paints left a mat finish, so I knew then I would need to apply a clear glossy top coat in the end. Once the paint was on it was time for the silver metallic “white-wash.” I started wiping the silver on and instantly was not happy with the look at all! It was not looking all shiny and sparkly like it was in my vision. As I wipe it off for the full “white-wash” effect, it even looked worse. Again, sorry, no photo because at this point I knew I wanted to get as much of the paint off as I could and needed to work quickly. So I just took one huge step backwards and needed to paint those surfaces white again and come up with another plan. By the way, this was Tuesday and I intended to mail the box on Wednesday. Nope, that didn’t happen! 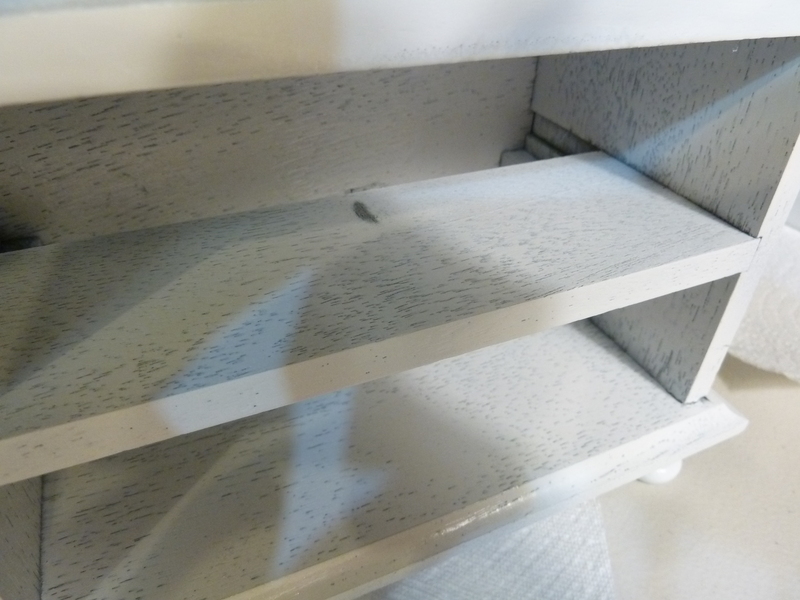 Not with another coat of white paint, plus dry time, plus what ever design I was going to paint, plus dry time, clear coat, dry time – you get the picture. I knew if I wrapped it up in one of my fabric gift bags before it was completely dry that the bag would be stuck to the box when my niece went to open it – not good. 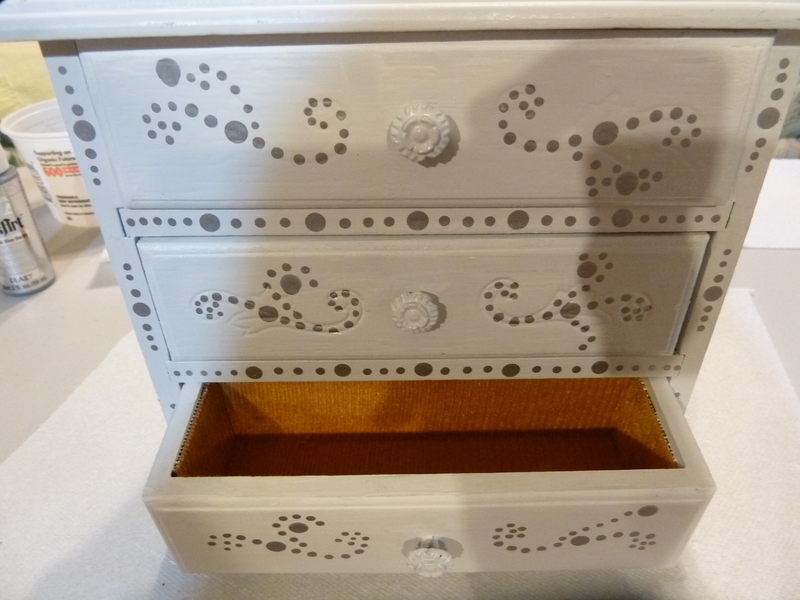 The jewelry box did have a cut design into the wood so I felt I was a bit limited and so I decided to follow that pattern with dots. Dots are super super easy to do, if you know the trick. 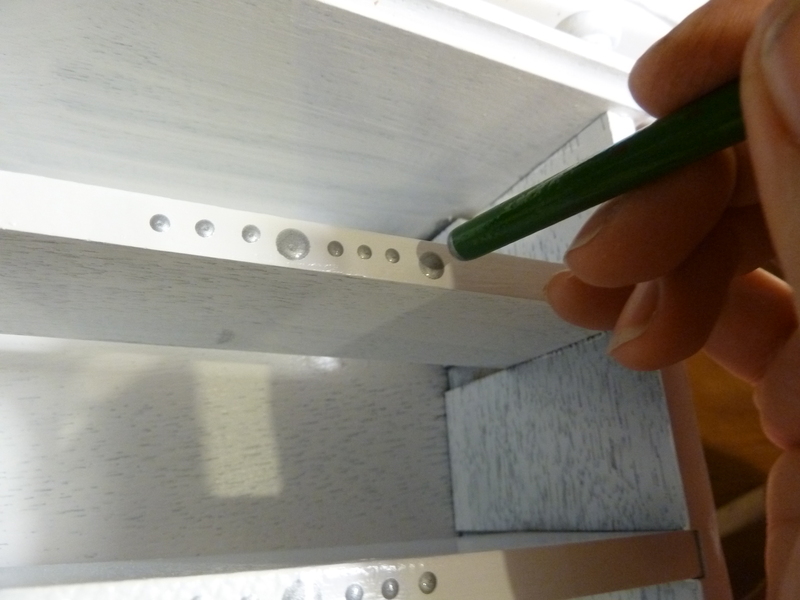 Use the end of your paint brush – the end without the bristles. Dip it in your paint and then touch it the surface you want the dot on. The size of the end of your brush will determine the size of your dot. Be sure to do a few test dots before you do this on your actual project and depending on the medium you are using you may get 1-2 dots before you need to reload the end of your brush, or you may only get 1 dot. 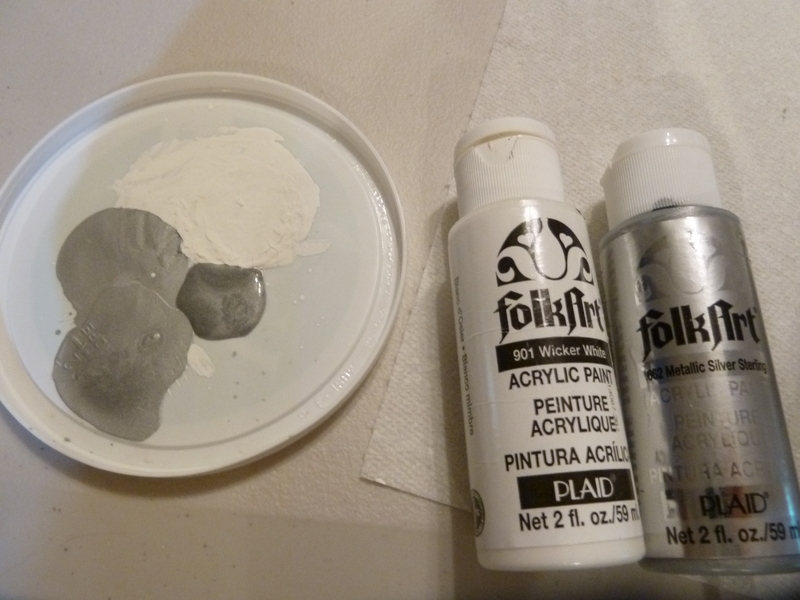 The silver metallic paint I was using was pretty thin, and I wanted a substantial dots with a sparkly impact, so I needed to dip the end of my brush in the paint for each dot. I did get the front and top of the box done and was going to move onto the sides, but time was not on my side. I hope that my niece will like her new jewelry box. Have you ever given something old a much needed facelift? I know they’ve moved me from Zone 5 to Zone 6, but I’m still planting based on the Zone 5 frost date of May 10. I always plant a range of home starts, nursery starts (although fewer and fewer of those) and direct. I like to do traditional seed starting, and a little winter sowing. The hardest part of all this is to make sure that you’re planting, first, in a way that doesn’t overwhelm you, and second, so that your seedlings are ready to plant out when the proper weather hits– the cool weather ones in early April, the tender solanums not until almost June around here. I use the wonderful “seed stash” tool at MyFolia.com to keep track of my seeds, but it’s most useful as a database. While it lets you note when you should plant indoors, and transplant, it doesn’t yet have a reminder function, and anyway, a pop-up box on my calendar or desktop is not a useful method for me. I like something really hands-on and visual, that puts it all in one place at a time. I’m pretty organized, plus like all gardeners I get antsy (plantsy?) in the middle of winter and start wanting to do something–anything–that seems like gardening. I used to sort by date into planting pots, but they tip over and get out of order. It’s really not optimal. So what I’ve developed is a seed keeper system, organized not by type, but by planting date and method. It allows me to select out of the larger seed stash the seeds I’m actually planning to plant, so I’m not constantly pawing through seeds trying to remember what to do, and I have a beautiful basket woven from recycled materials that a friend got me from Ten Thousand Villages which is a perfect size. I use them year after year. As you can see, I used some old fliers from one of my clients. If I was the entrepreneurial type, I’d probably propose that NDiN market these with a logo and a guide book for the different zones! 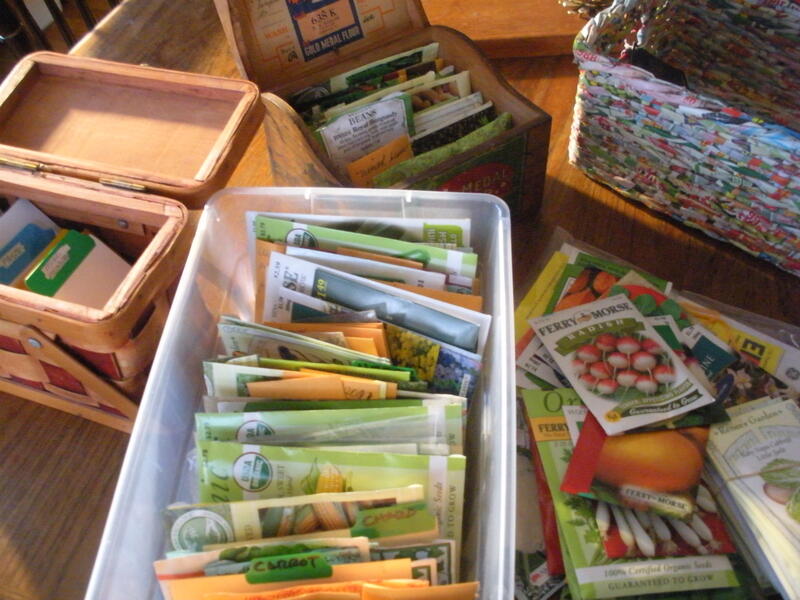 Once I have my cards worked out, I pull out my seeds, all organized by type (as you can see, this task is yet to be completed) and start pulling packets, to load into the planting system. 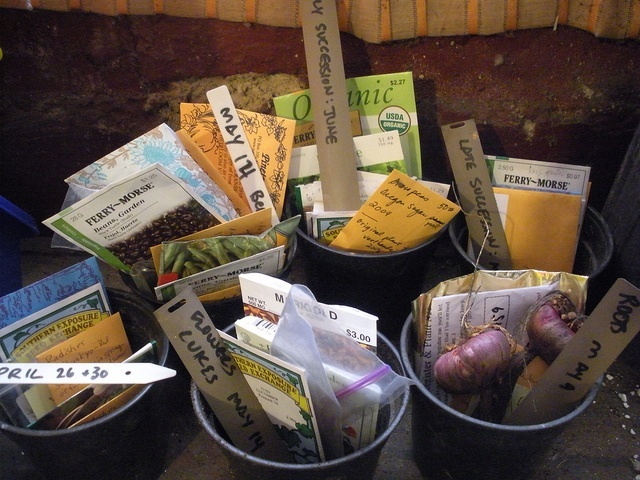 How do you organize for the planting season?